A few bits & bites from Kennesaw to Tucker. Red Roof Inn at North Druid Hills and Buford Highway will officially become a "higher tiered" Red Roof Plus+ April 1st. Red Roof's owner, Accor, says it will convert 30 properties across 15 states to "Plus" status by the end of their first quarter. The North Druid Hills property, referred to as the "Atlanta-Buckhead" location on the website, represents the only location in Georgia that will have the upgrades necessary to become "Plus." At least 6 Premium King and at least 6 Premium Double double rooms at the property will offer Rest Suite beds by Serta®, 37" flat-screen TVs, modern wood-like flooring, additional convenience outlets and upgraded towels. Best of all, the property will feature New, NEXTLEVEL™ SERVICE: This will mean, enhanced customer service training , elevated customer interaction (not sure what this means), upgraded uniforms and a designated customer resolution 800# - NextLine™. Full details here. Dunkin' Donuts is reportedly looking to build a new location adjacent to Intown Ace Hardware on Scott Boulevard near Decatur. Jimmy Johns is opening two new intown locations. One will be located near FLIP Burger Boutique at 1605 Howell Mill Road. The other will be on the ground floor of the Earthlink building in midtown at 1375 Peachtree Street, occupying the former My Friend's Place eatery. Einstein Bros. Bagels will open a new location at 800 Peachtree in midtown. The new Einstein's will be the third in midtown. The others are located at the corner of West Peachtree and 14th Streets and near Ansley Mall on Monroe Drive. (Einstein's, a casual eatery and member of the Metrotainment Cafes restaurant group, is located at 12th & Juniper and is not affiliated with the bagel shop in any way.) Einstein's recently completed the expansion of their Toco Hill location, but has not opened a new intown location in many years. The first Moe's to ever open, on Peachtree Road in Buckhead, was a former Einstein Bros. and they also once occupied a space adjacent to Bhojanic's Clairmont location as well. Cincinnati, Ohio-based Tavern Restaurant Group is bringing its British pub concept The Pub to Perimeter Mall. The new restaurant will occupy the former Hudson Grill which closed in early 2010. (Earlier intel had suggested that Gordon Biersch planned to bring their Old Chicago to the space, but those plans fell apart.) The nearly 7,000 square foot space will be reconfigured and remodeled to give patrons the feeling they are in an authentic British pub. The “Pour Your Own Beer Wall” will give patrons the opportunity to pull their own pints and pay by the ounce. The Pub's menu features classic British fare such as fish-n-chips and shepherd’s pie, along with more interesting options like bacon wrapped dates as well as both lamb and turkey burgers. The Pub's tagline is "British-Inspired, American-Crafted." The Pub is slated to open later this summer. To date, The Pub operates eleven locations in four states. Cruzado has closed in midtown. A DeathWatch inductee, the restaurant was operated by local foodie celebrity Grace Lee and its closure comes as little surprise. Lee's other venture, Hookah Cru on Glen Iris, remains open. Uptown Grill has closed at Suwanee Town Park. The restaurant opened last year in place of what had been Olde Town Tavern & Grille. Roxx Tavern will reportedly finally open their second location "in two weeks." I reported on the local restaurant's intention to open their new location on Northlake Parkway, but for whatever reason, the opening has been long delayed. The new Roxx will open in place of Chili's / Twisted Taco on Northlake Parkway, across from Target. 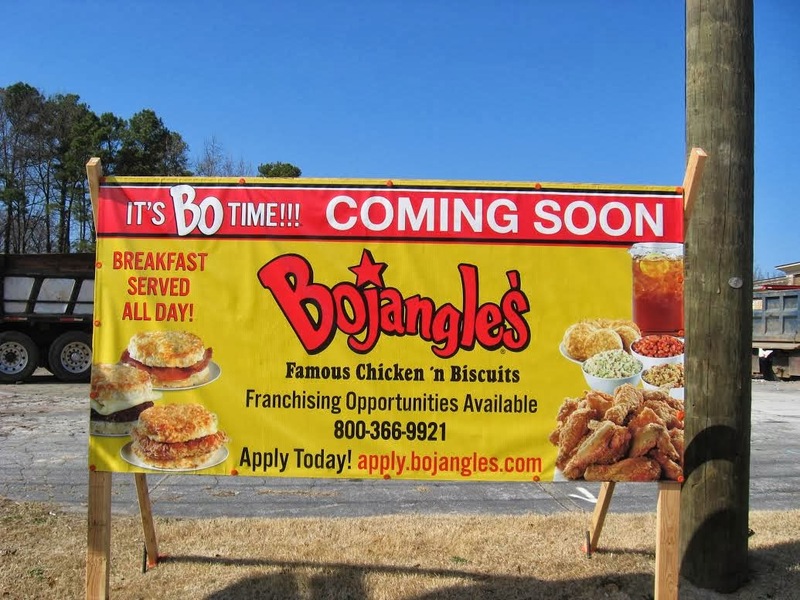 Bojangles' has reportedly finally broken ground on their new location on Lawrenceville Highway in Tucker. The new restaurant will be built adjacent to the relatively new RaceTrac gas station at the corner of Lawrenceville Highway and Northlake Parkway. I announced the restaurant last year, but the restaurant has reportedly been slowed by permitting and our recent weather. Prickly Pear Taqueria, located on the ground floor of Plaza Midtown, has "closed for renovations." The restaurant, located at 950 West Peachtree, had been both a member of my DeathWatch list and had been listed for sale for quite a while. I seriously doubt that there is any renovation going on, and instead would guess the restaurant is likely closed for good. Industry Tavern is reportedly finally getting close to opening at the Terminus building in Buckhead. The restaurant, previously known as Terminus Tavern, is replacing the shuttered Emerald Coast Cafe and will reportedly feature breakfast, lunch, dinner and late night options. I originally wrote about the restaurant opening this past October: sources today say it will open within 30 days. Chuy's long delayed Kennesaw location is finally under construction. I announced in November 2012 the chain's planned opening in Kennesaw, and at that time was told the restaurant would open September 17, 2013. That day came and went and later a Chuy's representative told me that the location had been indefinitely "tabled." With plans now back on track, sources say the restaurant should open in November or December of this year. Stone Summit Climbing & Fitness Center is building their second location on Busbee Parkway in Kennesaw. The original Stone Summit opened on Presidential Parkway, off I-85 in 2010. According to the Stone Summit website, the climbing gym remains the largest climbing gym in the country with walls 25 to 60 feet in height. Sources say the new gym will be slightly smaller than the original and should open in December. A former Circuit City turned LA Fitness was razed for the construction of the Kennesaw Stone Summit. The recent snow and ice have again pushed the openings of two new Willy's Mexicana Grill locations. According to well placed sources, the new Willy's at Cherokee Plaza will now open mid-March followed by the new location at The Village at Druid Hills in June. Yes, I have news on that space and will be sharing it shortly. I will tell you, it will not be an On The Border, sorry. Why do so many places fail in Atlanta? Red Roof Plus+ will certainly be appreciated. I hope they can "+" their clientele as well, to get a return on their investment in the improvements. That mountain would have been a nice location for an Element or Aloft. Too bad it's a RR.